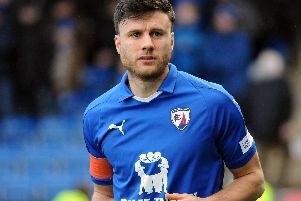 The departure of four key players from the ranks of Chesterfield FC is not a cause for concern, but optimism for Gboly Ariyibi. In a ‘glass half full’ statement, the winger says the exit of established first team stars will open up opportunities for young players like himself. And he fully believes they will challenge at the top end of League One again under new boss Dean Saunders. Ariyibi, who joined Spireites in August last year, began making inroads into the first team in the second half of the 2014/15 season. Speaking at the club’s media day on Monday, he told the Derbyshire Times he wasn’t worried about the impact the loss of Gary Roberts, Jimmy Ryan, Sam Clucas and Tendayi Darikwa will have. “With players leaving it’s all about how we adapt and push on, but I think we’ll be alright,” he said. Call it the impetuousness of youth, but the 20-year-old shrugs off any possibility of the club’s ambition waning in the face of the summer exodus. “I still think this club has high hopes,” he insisted. “What we achieved last season was probably unexpected, but when you come to this club and get in and around it, you realise that the players we’ve got here are all ambitious and want to do well. Having made 17 appearances last term during the reign of Paul Cook, Ariyibi is keen to add many more to his career statistics this season. He acknowledges that the exit of first team players could benefit him personally. “Maybe it will give me and some of the youner players more of a chance. “I think you’ve got to take care of number one, look after yourself and make sure you’re in the team all the time. USA-born Ariyibi is clearly enjoying life in the new Saunders era at the Proact, and hoping the positivity continues when the season kicks off at home to Barnsley on Saturday. “He’s (Saunders) brought in different coaching staff and fitness staff, so training has been different, but it’s been very good and we’ve coped well with it.